A Sweet & Effective Guest “Prompt” To Turn Off Cell Phones Before A Wedding Ceremony! At some weddings, especially the ones with a larger guest list, I frequently to go the front of the ceremony space with welcoming words and a request to turn off cell phones. When I saw this photo, I giggled. It’s perfect. And it gets the word across in an easy and sweet way. 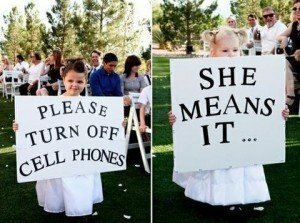 So, consider employing your flower girl(s) or ring boys pre-ceremony to greet guests with signage that works! Comments Off on A Sweet & Effective Guest “Prompt” To Turn Off Cell Phones Before A Wedding Ceremony!